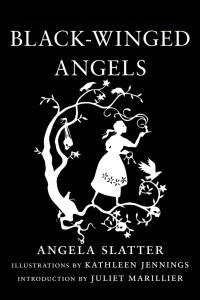 Black-Winged Angels, shortlisted for the 2014 Aurealis Awards for Best Collection, brings together 10 incredible contemporary retellings of fairy tales, featuring an introduction by multiple award-winning author Juliet Marillier, and illustrations by multiple World Fantasy Award nominee Kathleen Jennings. Black-Winged Angels is available only in a limited hardcover edition run of 250 copies. The collection is available for order here or as an ebook here. Black-Winged Angels has been shortlisted for Best Collection in the Aurealis Awards!